This is peanut’s biggest boy. He was born on Feburary 6, 2012. He was the last one of three born, and the first one to eat by himself with no help. We will probably keep him and train him for cart pulling, so his name is really important because he will live with it the rest of his life. Any ideas? Call me anything but late for supper! 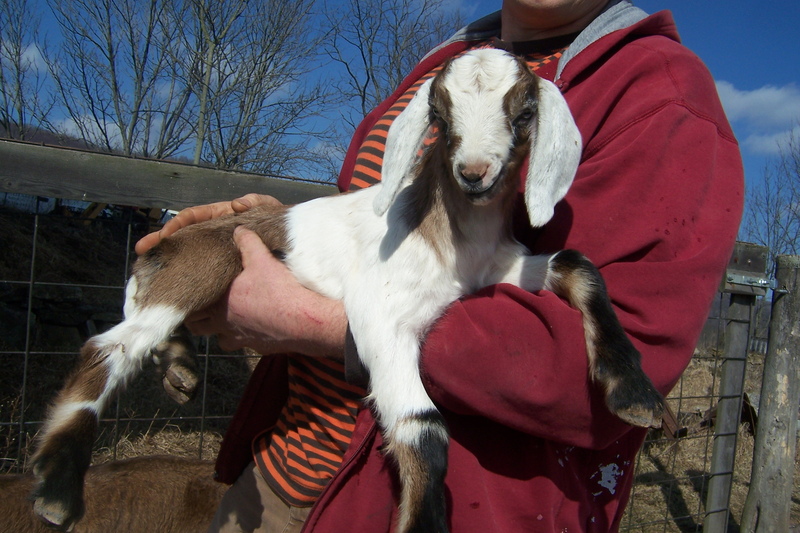 A little note about our goat names….. Our goats know their names and respond to them. Goats are very vocal, social creatures and it is truly remarkable how intellegent they are. Each of my goats are totally responsive when I talk to them, they know when I’m only talking to one, and they know when I’m addressing the herd. I feel like I have an extended family in the barn. We spend a lot of time with our goats and talk to them using their names daily. Well, he was born on my Dave’s birthday! David was a big boy; 9lbs 5 ozs. His favorite storybook was “The Three Billy Goats Gruff” so I would call him GRUFF! Hope you find the right one. He’s a cutie. So cute! And they are definitely better and more productive animals when you call them by name. Thank you everyone for voting on Facebook, the results are in and our little guy will be called Tug. Gruff is Tug’s brother. We are working with both of them now, they are doing great! Thanks again for the help. Thank you. Our buck, Buddy, makes nice babies. He’s a big boy too. Seems like Tug is a chip off the old block!